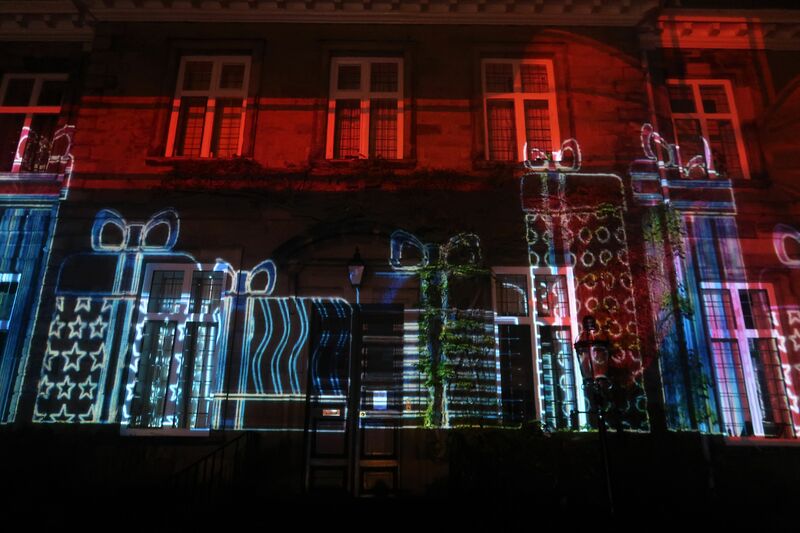 As part of our advent calendar each year I love to find things to do that are a little bit different. As we make our advent ourselves we do a mix of chocolates and little gifts each day aswell as having either an activity, a random act of kindness or just something Christmassy that we would all do together such as watch a film or have a picnic by the tree. For the big activities though I love to have a look at what is happening around and find new places to go and new things to experience. Maybe start a new tradition which we definitely have this year. 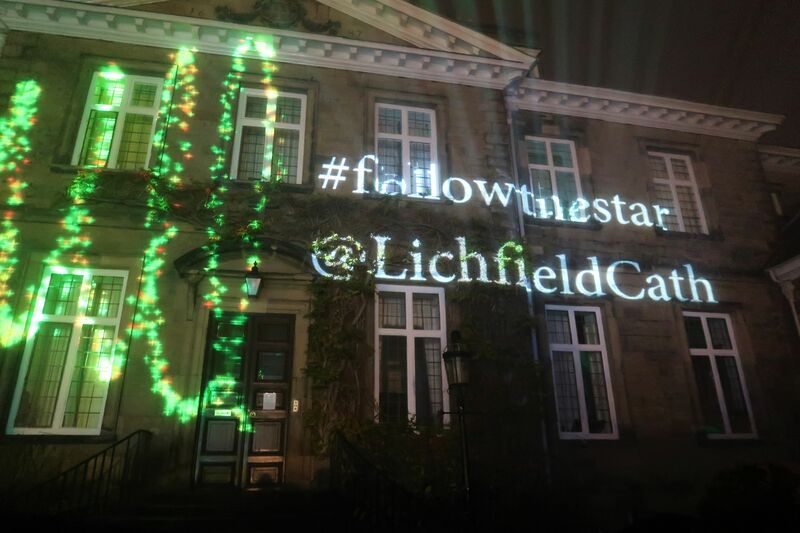 I happened upon the Lichfield Cathedral illuminations and immediately booked tickets. It was an evening event so I thought it would be a really nice treat to take Eva too and leave Roma at home. I think the one on one time is great and also so that at almost 7 she can feel a little more grown up and special, I love the idea that she will remember when she is older that we did these things together and that I made time for just her. Anyway so the evening came and we had booked a 7.45pm slot, we met with my sisters and joined the line of people to start the next loop. The illuminations started on the hour and then every 15 minutes afterwards so there never felt like there were too many people and everyone just moved along which was great, and meant Eva at just 6 could still manage to see everything. We gathered around the Cathedral school to start and the colours were so bright and vibrant, everyone counted down to the start and as the music kicked in I got all goosebumps and just wanted to scoop Eva up and hold her tight! It was brilliant and my favourites were definitely the trees, candy canes and Father Christmas who was pulled along on his sleigh by his reindeer. 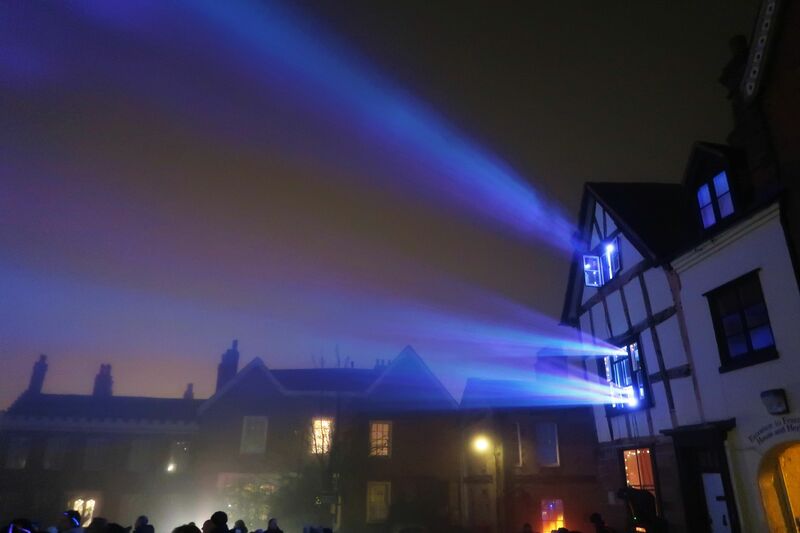 Being the kind of geek that I am I also had a look around at the projector and it gave off the most wonderful light flying through the air, that mixed with the fog made it seem really eerie and magical. 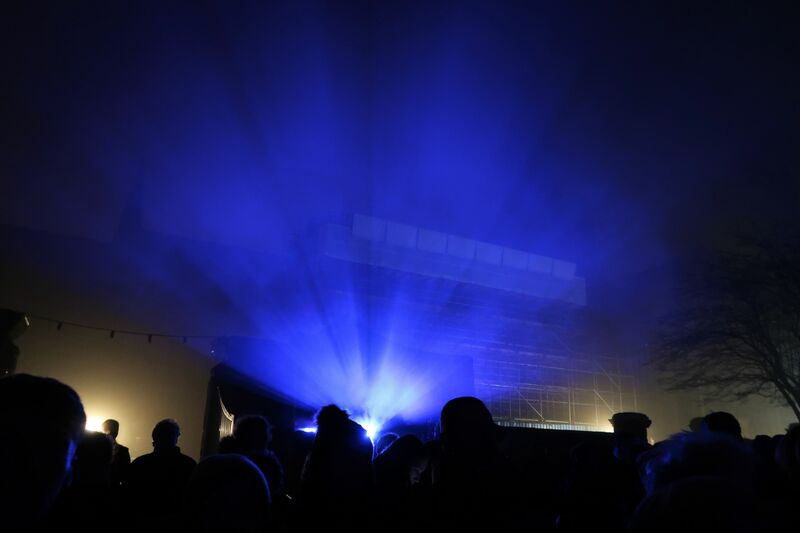 Once that was finished we walked the lamp lit path past the stand selling mulled wine and hot chocolate. I mean is there anything more perfect than standing in the cold watching the lights with a hot cup of chocolate and a mince pie at Christmas time? Perfection. 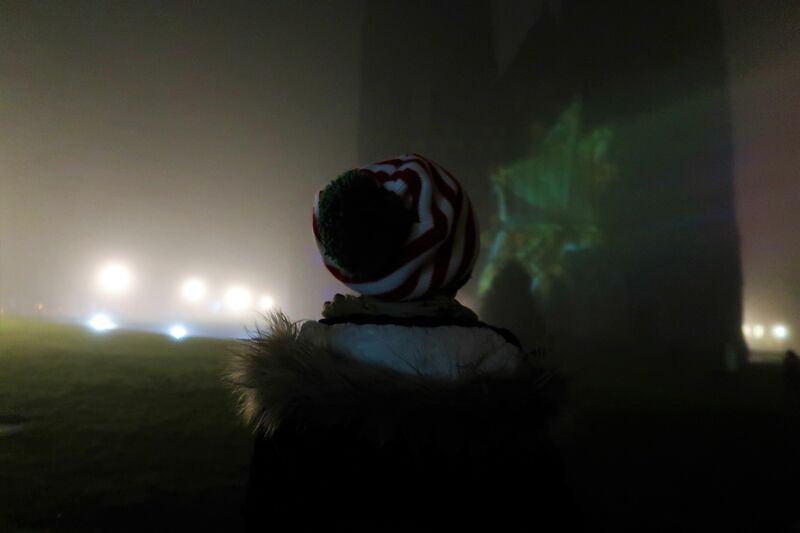 Unfortunately as we stood in front of the ever beautiful and impressive Cathedral itself it was so ridiculously foggy you could barely even see the top nevermind the illuminations. It was a real shame as we had been told how fantastic they were, how details and having seen the school ones we knew what we were missing but weather is weather and I know that couldn’t be helped. It was still really good but I do think it perhaps lost the impact had it been a clear night. 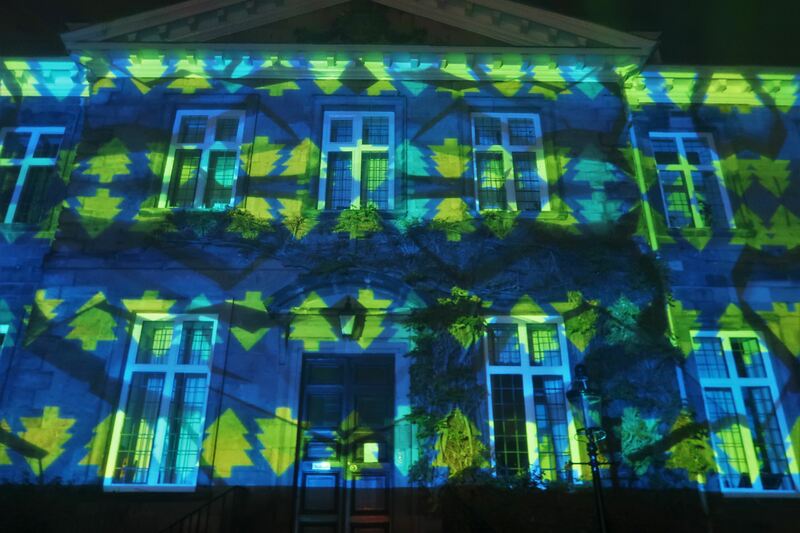 Again I was fascinated with the projector light too and as it escaped out of the windows of the house (or maybe it is a shop) opposite it definitely seemed mysterious with lights beaming overhead. Once over we were led inside the Cathedral building to the most spectacular sight where every inch was filled with blue light and stars and led to a nativity scene at the front. Eva loved looking at her face covered and was in awe of the detail it captured in the crevices of the walls and ceiling, not to mention the amazing shadows that it created. Further inside and there was a Starry night room with hanging stars both all down the walls filled with messages and lit up on the ceiling, it felt sort of like a spa as you sat around the outside of the room looking up, I could have stayed there all night! And the Christmas Tree festival too. 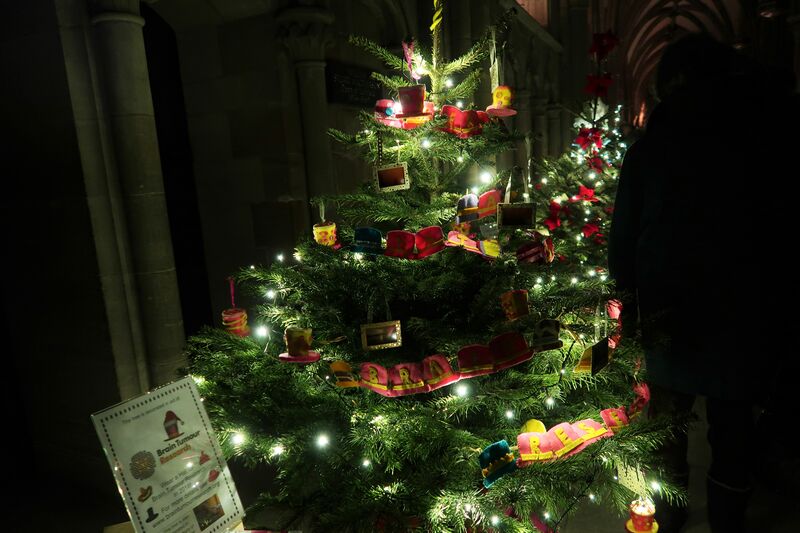 The Christmas Tree festival is where the Cathedral is lined with so many trees all decorated and donated by different causes, charities, companies or school and playgroups. Again Eva was fascinated looking at the detail and reading all the signs of who they were from and how each one was individually designed and created. of course the ones made by children appealed to her the most and her and her Auntie spent ages looking at the individual decorations. The way they lit up the walkway was really something. At the bottom end of the Cathedral was a wishing/prayer tree where so many peoples thoughts and wishes hung, always such a humbling sight, and of course candles. 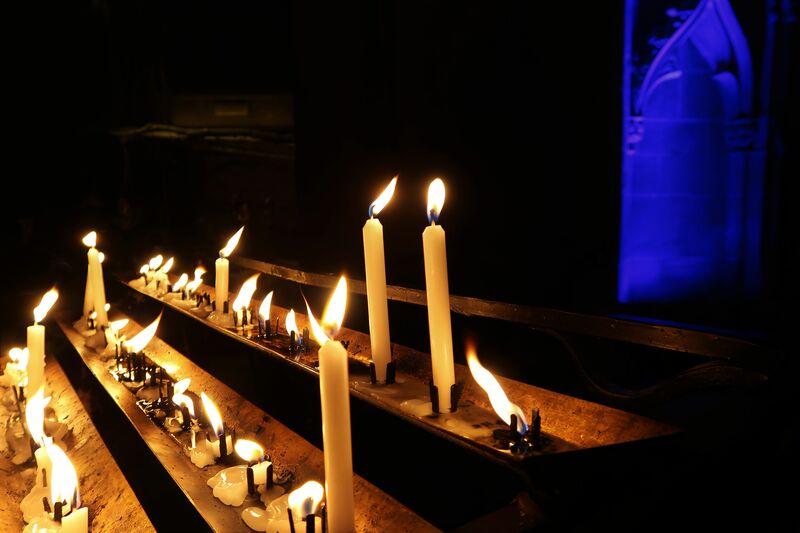 Every single Church or Cathedral that we go to in the world since we lost my Nana last year when we were in France we always light a candle for her. Christmas is always such a reflective time anyway but standing there with Eva and my sisters lighting a candle for her despite none of us communicating that it was in fact for her, felt lovely. A little nod to a Merry Christmas from us and a sign that she is there with us wherever she might be. 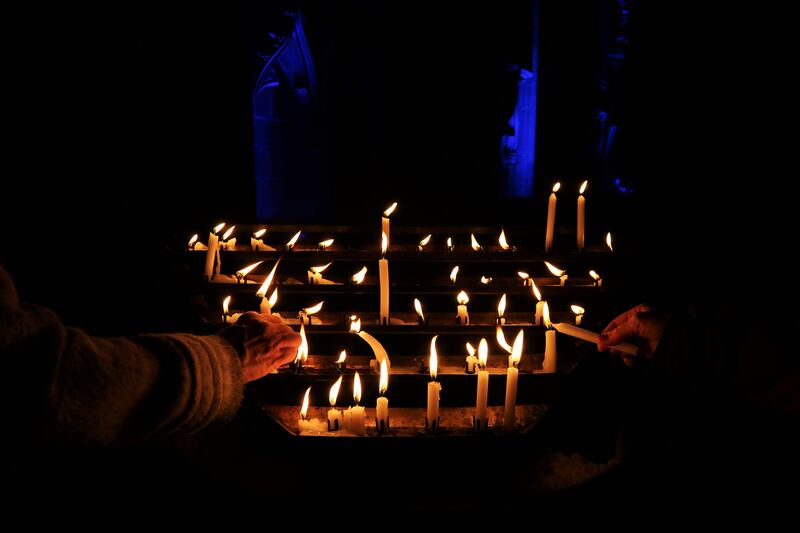 I really love this picture of the candles because although I do not know the hands of the people in it, I do not know their story or the story of the candle they hold in those hands, it is humbling to know that there is one, to not only think of loves and loses of your own at this time but to know everyone is carrying theirs too. We walked back up to the side exit of the Cathedral past more beautiful trees and back out into the fog, with the help of a lovely man and his torch down the steps! 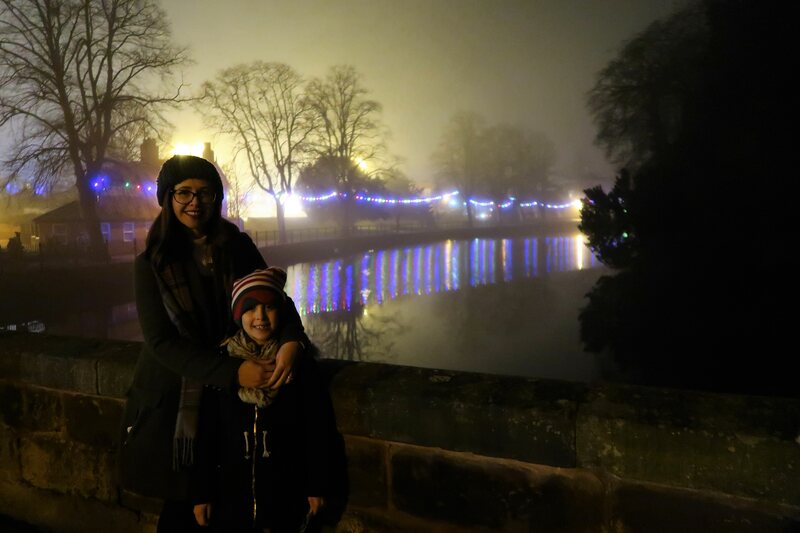 It was such a beautiful crisp night and although it was a real shame it was foggy that also made it a bit special too, it definitely made the lights and river look amazing. 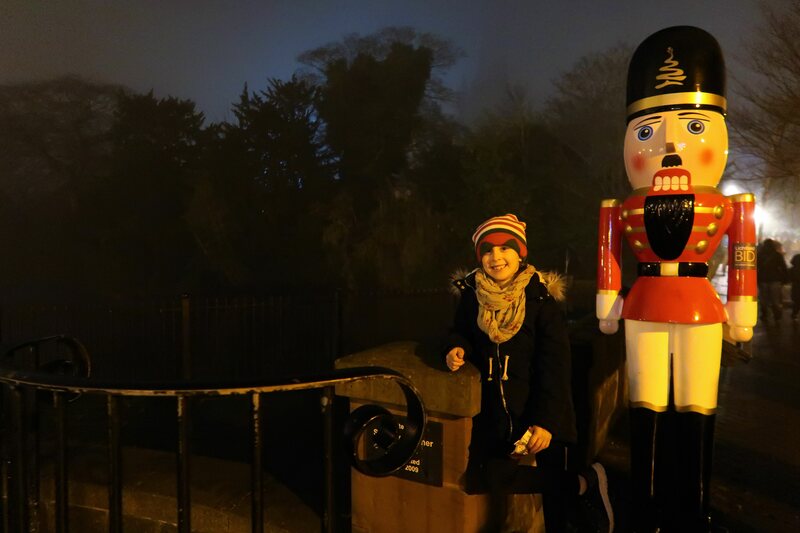 It was super late, about 9 oclock when we left but Eva was still full of beans and especially when we came across the nutcrackers that were standing around Lichfield. We chatted and laughed and skipped all the way back to the car and home where she was so tired she collapsed in bed still fully clothed, a sign of an enjoyable night if nothing else! 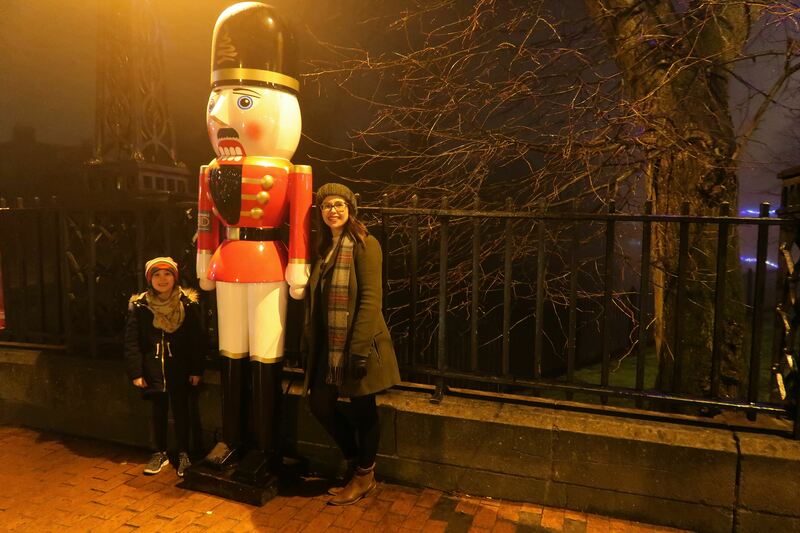 I love having Christmas traditions and time with my big girl and we will be back next year for sure, perhaps just without the fog! The tickets were £10.50 for a family ticket (2 adults 2 children) and I think £4.50 for an individual adult booked in advance and I think they are slightly more on the night. I also vlogged and have made a short video if you would like to see some of the show and the stars inside the Cathedral too.